This article is a short summary of Mario Strikers Charged. Mario Strikers Charged, known in Europe as Mario Strikers Charged Football, is the sequel to Nintendo GameCube title Super Mario Strikers. It is a soccer game for Wii. NTSC: Battle on 17 interactive fields using all-new Mega Strikes, super abilities and skill shots to devastate the competition. Charge the ball to increase your chances of scoring, and use the Wii Remote to flatten foes and defend your goal! Play up to four people online over Nintendo WFC! PAL: Mario and his friends are back on the football pitch, and now the challenge is even bigger thanks to the Nintendo Wi-Fi Connection! Unlease a powerful MegaStrike against your opponent! Use the Wii Remote to destroy all of the balls! Who can stand against Mario's Super Ability? Use the Nintendo Wi-Fi Connection to play against your friends, or anybody else! Play together with a friend in the same team! Charge the ball to the maximum to score with ease! 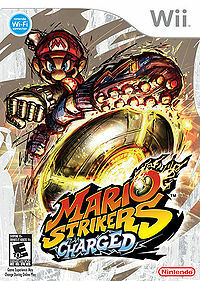 Mario Strikers Charged plays a game of soccer, but is much more unrealistic and unruly than a traditional game of soccer. Whereas in a regular game of soccer, if players attacked each other, they would be punished, but Mario Strikers Charged encourages attacking other players with tackles, even knocking them into dangerous hazards. Players can use standard kinds of shots, or special kinds of moves. Passing the ball repeatedly would make a shot more powerful. Sidekicks can use skill shots, which can harm the goalkeeper, Kritter, or shoot straight past him. Captains can use Mega Strikes, which involve them jumping high up into the air, and using a powerful attack that will produce multiple soccer balls, allowing the captain to earn more than one goal with the one Mega Strike. Is the opponents to the players are using a Mega Strike, the player controls Kritter, who cxan break the incoming balls by having the player use motion controls to locate and break the soccer ball. This page was last edited on 6 November 2018, at 12:46.